Super fun square silk scarf with a printed circus scene. Hand rolled edges. Small 16.5" square size. Pink with cute floral prints in green & white. Length from rear neck to hem: 21". Across the shoulder seam 20-21" taken lying flat. Rocking horses and flowers around the edge. Pine cone decorations. Hand Rolled Made in China. Signed Tammi S Keefe. Beautiful scarf by Kimball. Green Hand Rolled edge Made in Japan. 22" x 21" orange boarder. 100% Acetate. 21" x 21" Square. Pink / Brown. 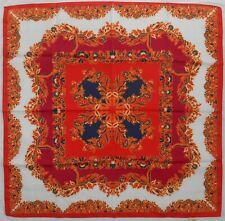 This 60s/70s, Italian, Handrolled Silk Scarf is Minty! Gently/Rarely Worn. There is no major wear whatsoever. Colors and Silk Fabric is Fresh and Bright. No stains. Hand Rolled Edge is Excellent. Size : approx: 26" Square. Size : approx: 30" Square. Fabric : Polyester. Size : approx: 26" Square. Fabric : Polyester. Circa 1960ies. Composition: 100% wool. Colour: beige with pink roses and green leaves. Condition: like new (never worn). 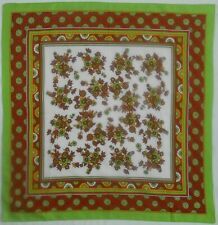 Vintage 70s scarf with squirrels and nuts. Original 70s vintage item. I'm sure you'll never see another. Measurements Approx 13" x 60" Condition is very good. I can't see any holes or marks. Your beautiful item will come to you carefully wrapped and sent via Royal mail fully insured. I take great care in preparing each item so it is clean and ready to use and describe honestly. lining feels like silk, outer very likely to be so too. high quality item.not cheap and flimsy but positively elegant and expensive.